On 06 April 2012 the National Movement for the Liberation of the Azawad (MNLA) announced the independence of Azawad. Billal Ag Acherif, a former Libyan army colonel and the military leader of the NMLA, issued a statement explaining the drive for independence that referred to "the accumulation of more than 50 years of bad governance, of corruption and of military-political-financial collusion, endangering the existence of the people of Azawad and imperiling the stability of the sub-region and international peace." The Tuareg [also seens as Twareg or Touareg] are a seminomadic, pastoralist North African Berber people. Nominally Muslim, they presently number approximately 1 to 1.5 million. 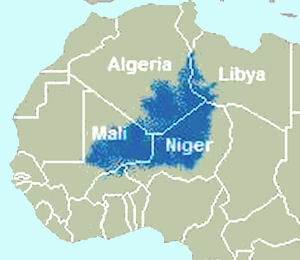 They are grouped into independent federations and live in southern Algeria, southwestern Libya, Mali, and Niger, and in leser numbers, in Burkina Faso and Nigeria. Although are minorities in the countries they presently inhabit, their cultural unity is far-reaching. Tuareg society is stratified and includes a noble class, tributary groups, and marginal classes made up of religious leaders and artist/smiths called inadan. The Tuareg once controlled the caravan trade routes across the Sahara. Today their economy is based on breeding livestock, agriculture and trade. They speak Tamasheq, a language related to other North African nomadic peoples, as well as French, and they read and write using a script called Tifinar, which is related to that of ancient Libya. They are sometimes referred to as "the people of the veil" or "the blue people of the Sahara" in reference to the indigo turbans worn by men, which stain their skin and define their identity. Tuaregs define themselves against others -- more by who they are not than by who they are. Like Berbers, Tuaregs are a jumble of ethnicities, and as such see themselves as "not Arab" and "not Black African." The pre-colonial economies of the Hausa and Tuareg functioned as two interdependent sectors within a regional economy, interacting across the ecological frontier at the desert edge. A close examination of the pre-colonial economy of the area reveals that the southern Sahara and adjacent areas of the savanna were so closely integrated as to constitute a single economic region. This region was subdivided into areas of local specialization, with the desert sector supplying animals and other products of the arid lands and providing specialized personnel experienced in craft production and trade. The savanna in turn supplied grain and local manufactures. More importantly, the savanna served as a haven for the people'of the desert in times of drought. The Tuareg secured a living from the harsh desert environment by specializing in animal husbandry. The basis of their economy was pastoral nomadism, an extreme form of adaptation to an arid environment where scant rainfall was highly variable in both space and time. The seasonal pattern of the rains along the desert fringe, with precipitation from May to Septemaber but normally concentrated in July and August, necessitated seasonal transhumance [that is, the transfer of livestock from one grazing ground to another with the changing of seasons]. The nomadic Kel Adrar Tuareg of the Iforas in Mali maintain diversified herds in an area with variable rainfall. The cattle and sheep eat grass, the camels eat grass and trees and thorn bushes, and the goats eat trees and thorn bushes; animal gestation cycles also vary. The Tuareg strategy in adapting to their environment is to give and lend animals to their friends and clan members and to change locations. Long distance migrations help maintain clan alliances, destocking of grains and stocking of livestock, and hunting and gathering and trapping as needed. Population is limited due to the rigorous lifestyle. The concentration of Tuareg population along the southern fringes of the desert placed most people in close proximity to farming villages and savanna markets. For the Tuareg of the Air, Tegama, Damerghou, Azawak, and Adar, this meant the area centering on the Hausa states. In addition to the trade in salt, dates, and animals, another important supplement to Tuareg income came from escorting and providing transport services for trans-Saharan caravans, which also followed the rhythm of seasonal transhumance. Besides grazing sites and numerOus'estates, :the.Tuaregnetwork in the savanna included urban communitieu of brokers, landlords, and craftsmen. These diaspora communities formed the core of an elaborate commercial infrastructure which permitted nomads to move"freely throughout the savanna, exchanging desert products for grain and local manufactures. The seasonal-pattern of Tuareg transhumance and the trade network associated with it not only formed a link between the economies of the desert and savanna but also functioned as a safety valve for desert peoples during drought. Interdependence enabled them to survive by migrating to the far southern end of the network, to limit losses in the herds by pasturing animals in the south, and to rebuild their resources after a period of temporary sedentarization. The French colonial administration, to begin with, was highly centralized. By requisitioning large numbers of Tuareg camels, the French were able to administer the Tuareg lands they occupied, while also undermining the ability of the nomads to mount an effective resistance. In 1913, the year of the drought, requisitions reached crisis proportions when the French occupied the Tibesti Massif. Camel losses from both sources undermined the basis of the desert economy -- animal husbandry, the salt and animal trades, and income from providing transport services. Revolts broke out in the Air, Azawak, and near the Niger Bend. The French finally put down the last of the resistance in the Air Massif in 1918, but the revolt and the effects of its lepression seriously compounded the pre-existing crisis and prolonged it for many years. The twentieth century saw profound changes in the Tuareg way of life: the end of French colonial rule and the creation of new countries with established borders; devastating, repeated droughts that annihilated their herds of livestock; and political marginalization and rebellions. Prolonged periods of drought in the area have reduced the amount of land suitable for agriculture and herding, meaning fewer traditional sources of income and employment for nomadic Tuareg tribes. Their social organization and economy have been substantially transformed, and today most Tuareg have given up their nomadic lifestyle, settling instead in villages and towns. The historical Tuareg slave trade has disappeared in the region as Tuareg culture has become more urbanized. However, there are concerns about modern forms of slavery, such as trafficking, that occur within the scope of criminal activity [in at least one case, a Nigerien girl was used as payment for a shipment of contraband from Niger]. Vibrant trade routes that rely on bartering continue to thrive in the Sahel, providing economic stability as well as ample opportunities for smuggling contraband. Tuaregs, as well as Arabs, Cameroonians, Congolese and Chadians, smuggle gas, cigarettes and a variety of other contraband. Tuareg guides, some of whom work as smugglers outside of the tourist season, know the desert well and can map safe routes with ample sources of water. However, desert travel is not without risks. Not all smugglers are familiar enough with the location of wells. Vehicles break down, and sometimes people lose their way. These people are doomed. Libya's Qadhafi always had a vision of himself as custodian of an ancient Tuareg homeland spanning the bulk of the Sahara. Qadhafi did not feel beholden to any current leader or system of borders, and believed he could simply show up unannounced anywhere in the Sahara for a visit. During Libya's sporadic 1978-1987 war with Chad, when Qadhafi realized the war was not going well, he recruited, trained and armed groups of Tuareg tribesmen from other parts of the Sahara. The legacy of the gradual end of the conflict in the late 1980s and early 1990s was a militarized Sahara, with armed Tuareg mercenaries ready for a fight elsewhere, who had bought into Qadhafi's irreverence for sovereignty and modern borders. This fueled the initial Tuareg rebellions in northern Mali and Niger in the 1990s. is Ibrahim ag Bahanga was the maverick Tuareg rebel leader known to seek refuge in Libya when not fighting the Malian government in northern Mali. A fragmented Tuareg population, a lack of discipline, and traditional smuggling patterns all made for fertile ground for Libya to cultivate. Qadhafi incited the Tuaregs towards autonomy. Developing a better understanding of Tuareg activities and motivations is an important priority for Western governments, especially since they develop ad-hoc agreements with Al-Qaeda in the Land of the Islamic Maghreb (AQIM) elements in support of trafficking and perhaps kidnapping. Mali views the threat of a new Tuareg rebellion as more dangerous than that from AQIM, and neither Mali nor Niger could count on Tuareg leaders to fight against AQIM. Breakdowns in traditional ethnic political, social and economic networks are potentially destabilizing. The modern battle for control of the Sahara has heated up in recent years, with movements of people, weapons and contraband accelerated by Toyota land cruisers and improvements in technology and infrastructure. Several decades of post-colonial borders have broken Tuareg unity, creating tension between individual state security efforts and those such as Libya's Qadhafi who appealled to a glorified nomadic past. Trade routes traditionally controlled by Tuareg tribes, including inventoried merchandise and documented passage, are now up for grabs to a constellation of Tuareg, Arab, African and other groups who continue the commercial tradition as smugglers. Millions of euros in known ransom payments, free weapons and new infrastructure projects have created a market in which desert tribesmen are encouraged to take hostages and increase drug and other traffic, offering the spoils to the highest bidder.